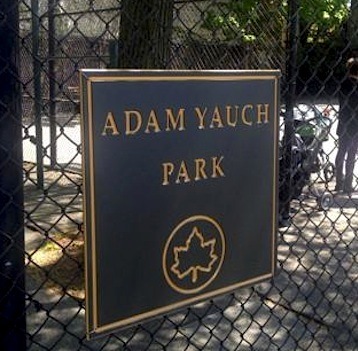 Palmetto Playground in New York was filled with fans, friends and family of late Beastie Boy Adam Yauch today when it was re-named in his honor a year after his death on May 4, 2012. Fellow B-Boy Adam Horovitz remembered Yauch for his warm personality and individuality as a musician at the Brooklyn playground on Columbia Place & State Street, now called “Adam Yauch Park,” where his friend and bandmate learned to ride his bike as a kid. Also in attendance, City Council Member Stephen Levin, Borough President Marty Markowitz, Bikini Kill/Le Tigre frontwoman Kathleen Hanna, and Yauch parents, Noel and Frances.